We’d love your help. 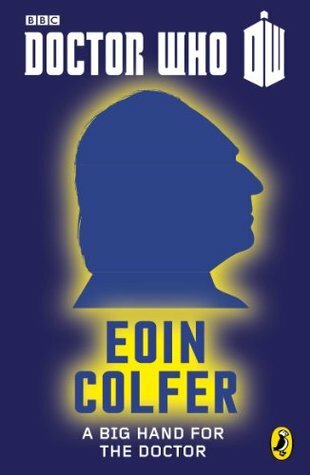 Let us know what’s wrong with this preview of A Big Hand For The Doctor by Eoin Colfer. London, 1900. The First Doctor is missing both his hand and his granddaughter, Susan. Faced with the search for Susan, a strange beam of soporific light, and a host of Eleven Doctors, eleven months, eleven stories: a year-long celebration of Doctor Who! The most exciting names in children's fiction each create their own unique adventure about the time-travelling Time Lord. To ask other readers questions about A Big Hand For The Doctor, please sign up. Eoin Colfer + Doctor Who sounded like the greatest mix ever. I wasn't terribly into this story and am not sure how familiar Eoin is with Doctor Who, but it was still fun! This is the first short story celebrating the 50th Anniversary of Doctor Who. Each short story will be centered on a different Doctor. Presenting the doctors in order of appearance in the franchise. For some reason, all the stories will have only one companion. The extension of each short story will be of 40 pages, more or less. Due the general decision of using only one companion on each story, on this tale you have Susan Foreman as the companion of the First Doctor. Which means that thi This is the first short story celebrating the 50th Anniversary of Doctor Who. Each short story will be centered on a different Doctor. Presenting the doctors in order of appearance in the franchise. For some reason, all the stories will have only one companion. The extension of each short story will be of 40 pages, more or less. Due the general decision of using only one companion on each story, on this tale you have Susan Foreman as the companion of the First Doctor. Which means that this adventure is before of meeting Ian Chesterton and Barbara Wright. And with that in account, it's set before of the events of An Unearthly Child. Which to me, it's a wonderful idea. The story introduced new villains: The Soul Pirates. It's something laudable to create a new kind of menace instead of using yet again popular opponents like the Daleks or the Cybermen. The adventure isn't too interesting or creatively developed. Also, at the end you realize that it's a "forced" story just to justify a "surprising" epilogue. There too many references to information that since it's the First Doctor, and even more, an adventure even before the beginning of the series, I didn't find necessary to use. You are barely starting to read and you already find info that the Doctor is a Time Lord, that he's from the planet Gallifrey, that he can regenerate and even that he has two hearts. Fifty years later that's basic knowledge of any fan of Doctor Who but back then it was supposed that all those facts were yet to be known. I supposed that in a long novel, I wouldn't mind and I could understand the need to use that even in a First Doctor's adventure. However, since it'd be a short story of only 40 pages, I think that Eoin Colfer, the author, could develop his story without "revealing" those facts. Right from the beginning of the short story, the First Doctor loses a hand, and he needs to use a temporary hand while waiting that a "new hand" can be made by some kind of alien scientist. That was an intriguing plot and even the meaning of the title of the short story. However, you never feel that that factor is relevant to the development of the story. It could be omitted and the story would resolve just the same. It's a First Doctor's adventure set before of the beginning of the TV series, but the Doctor is shown doing so many physical feats that I found odd since at the beginning those kind of tasks were the role of Ian. I know, he isn't in the story, but I think that the author could develop some tale having the Doctor in a more cerebral role. Firstly, if this wasn't supposed to be a Doctor Who book, it would be a perfectly functional (though workmanlike) kids adventure story. The glaring problem is that it's supposed to be about the First Doctor, and he is entirely absent. Instead of the slightly frightening, selfish, frail old genius kids met for the first time in the sixties, we have here a heroic righter of wrongs, who strides into one on one combat with armed killers, and swan dives off rooftops to save little children. I was look Firstly, if this wasn't supposed to be a Doctor Who book, it would be a perfectly functional (though workmanlike) kids adventure story. The glaring problem is that it's supposed to be about the First Doctor, and he is entirely absent. Instead of the slightly frightening, selfish, frail old genius kids met for the first time in the sixties, we have here a heroic righter of wrongs, who strides into one on one combat with armed killers, and swan dives off rooftops to save little children. I was looking forward to these 50th anniversary eleven shorts of eleven Doctors, but I have to say they're not off to a great beginning. The most important thing in any Doctor Who fiction is getting the characterisation right. With eleven different Doctors, there can be personality mix-ups. The biggest crime is to give one Doctor the personality of another - yes, there are some characteristics shared between them all, but they are ALL distinct personalities. And this is not the first Doctor as po I was looking forward to these 50th anniversary eleven shorts of eleven Doctors, but I have to say they're not off to a great beginning. And this is not the first Doctor as portrayed by William Hartnell. This is a mixture of Ten and Eleven in an older body. The mentions of Hogwarts and other contemporary pop culture references make this stand out. Sure the Doctor has travelled in all times and dimensions, but the first Doctor wasn't really concerned with them. It's disappointing as I have a special special place in my heart for One, along with his granddaughter (and first companion) Susan. There's so much that could have been done with them. There is better fan fiction out there that is more effective at portraying One, so to have the official 'professional' fiction foul up so spectacularly is really quite unforgivable. How many offences against the mystery and wonder of Doctor Who can you fit in 40 pages? An awful lot apparently. I blame the editor and publisher. The author obviously has little knowledge of Doctor Who. In a story set before 'An Unearthly Child' (yes, major offence number one) we see a First Doctor who is an action hero, who has visions of his future selves, who references 21st century pop culture, references of Time Lords bandied about left right and centre, and a childhood flashback with the D How many offences against the mystery and wonder of Doctor Who can you fit in 40 pages? An awful lot apparently. I blame the editor and publisher. The author obviously has little knowledge of Doctor Who. In a story set before 'An Unearthly Child' (yes, major offence number one) we see a First Doctor who is an action hero, who has visions of his future selves, who references 21st century pop culture, references of Time Lords bandied about left right and centre, and a childhood flashback with the Doctor's 'mother'. To top it all off we experience the adventure with regular glimpses of the Doctor's thoughts. I know this may sound extreme, but to me this story shows no respect to the series at all and the fact that it was published is slightly offensive. These ebooks are meant to be a celebration of 50 years of Doctor Who. To have the first one come along and direspect the franchise so much is a joke. There are plenty of writers who would have produced a more respectful and better quality story. There is no understanding of the basic premise of the franchise. It was ok, maybe not the best start to the series of shorts as it felt a little incomplete and didn't entirely have me hooked. He’s an odd character, The Doctor. He starts off old and grumpy and mostly gets younger and more energetic as the years go on. His 11th carnation must look back at his 1st self and wish that he’d lightened up a bit. This is the first of a monthly series of tales – each featuring a different doctor – designed to celebrate Doctor Who’s fiftieth anniversary. Here Eion Colfer (an author I’ve never previously read) takes the first Doctor for an adventure. We’re in Victorian times and there are flying He’s an odd character, The Doctor. He starts off old and grumpy and mostly gets younger and more energetic as the years go on. His 11th carnation must look back at his 1st self and wish that he’d lightened up a bit. This is the first of a monthly series of tales – each featuring a different doctor – designed to celebrate Doctor Who’s fiftieth anniversary. Here Eion Colfer (an author I’ve never previously read) takes the first Doctor for an adventure. We’re in Victorian times and there are flying children and pirates and the whole thing is a clever and energetic pastiche of Peter Pan (though it might tip its hand too far in the epilogue). I say the set-up is clever, but perhaps that cleverness is double-edged as a number of jokes don’t really work in context and the references sometimes seemed a little jarring. Now logically the Doctor, having hung around Earth in his first incarnation, would know what Hogwarts is, but it still seems odd to think of William Hartnell’s Doctor referring to it - surely he would just be too curmudgeonly. Worse perhaps is that the Doctor and Susan are bland and generic, and frankly weak in comparison to the clunky stereotypes that populate the rest of this slight tale. The most rounded figure is that of Aldridge, the go-to man for new hands. You warm to his relentless crankiness much as you did to the First Doctor's, but this similarity only makes the actual Doctor's persona in this eBook seem even wider of the mark. A Big Hand for the Doctor is a story featuring the first Doctor and Susan in a story which we can only assume is set before they meet Ian and Barbara in a junkyard in 1960's London. The story is ostensibly about the Doctor getting a new hand grown by this alien surgeon who seems to be hiding in England in the 1900's and about how the Doctor managed to lose his hand in the first place, and how the surgeon lends him for the time being a much larger, and female, hand. This version of the first Doct A Big Hand for the Doctor is a story featuring the first Doctor and Susan in a story which we can only assume is set before they meet Ian and Barbara in a junkyard in 1960's London. The story is ostensibly about the Doctor getting a new hand grown by this alien surgeon who seems to be hiding in England in the 1900's and about how the Doctor managed to lose his hand in the first place, and how the surgeon lends him for the time being a much larger, and female, hand. This version of the first Doctor seems to be aware of what his future regenerations will look like, in particular the eleventh Doctor, which is a bit odd. He doesn't really act like the Doctor that we know either and it is hard to imagine the first Doctor doing any of the things that occur in this story. The same can be said for Susan as it happens. The story itself is well written and has some interesting characters in it such as the surgeon who is going to grow the Doctor's new hand, but just doesn't really interest or intrigue me enough to go back to it. This is not the First Doctor. The plot was okay, I suppose. Nothing special. But the characterization was terrible. I'm fairly sure Eoin Colfer hasn't seen any episodes of Doctor Who featuring the First Doctor. If he had, he never would have written this. I didn't like the way it was written, either. It was written for children, and the writing was very simplistic. However, Colfer often used archaic or more "adult" words. I'm pretty sure that would annoy most children. For instance, he used a word that basically meant "bedpan." How many modern children would even know what that was, let alone alternative words for it? I have only given one star to one other book. When you consider this book features one of my favorite characters of all time...Well, it's pretty bad. I'm sorry the First Doctor got this book to "honor" him for the 50th Anniversary. I am going to continue the series, because each book is by a different author, but I'd recommend skipping this one. I did enjoy this. Rather unexpectedly feely, in some places. Very sweet insight into the Doctor's past. Funny too in some parts. All in all, not bad at all. Tis story was a little meh, the best thing was the epilogue which gave this a nice twist and spin. Having received the 12 Doctors, 12 Stories box set for Christmas - including this book - I thought to give the first book in the series a second read, having read it very almost two years prior. I remember being outraged that this; the first William Hartnell novel since 2005 (or 2004 - I forget) was terrible. I really hoped my opinion altered on my second read. Unfortunately it didn't. In fact I think I came out of it thinking of it worse than I did the first time. The book series was released in commendation of Doctor Who's 50th Anniversary and yet this book manages to insult anything and everything in William Hartnell's fantastic era in less than 60 pages. If in Hartnell's reign there was nothing but terrible plots, inconsistent and two dimensional characters and cheesy dialogue, then this book would be a perfect summary of it. Sure - some of the time the plots were less than memorable - but never did I feel a character was as badly written as in Eoin Colfer's interpretation of it. Colfer had the job of characterizing only two characters existing in the show, seeing as it only stars the Doctor and Susan, correctly in only around 10,000 words and yet he managed to mess that up so greatly I facepalmed at least 15 times reading the book. Imagine if someone were to get an extremely deep character, boasting hundreds of traits, and just characterizing them with just one. That is basically what Colfer did, with a bland writing style, lacking emotion or any suspense at that. The story takes place before the Doctor took on any companions, and just had his granddaughter, Susan. It happens in Victorian London. The story itself is very brief. The only reason it took me so long to read it was that I had too many things going on to read for more than a few minutes at a time. It's okay. I like some of the concepts in it, like the pirates, and it would be cool to see them again somewhere, maybe in a longer novel or an episode. It wasn't bad as some of the other reviewers fo The story takes place before the Doctor took on any companions, and just had his granddaughter, Susan. It happens in Victorian London. The story itself is very brief. The only reason it took me so long to read it was that I had too many things going on to read for more than a few minutes at a time. It's okay. I like some of the concepts in it, like the pirates, and it would be cool to see them again somewhere, maybe in a longer novel or an episode. It wasn't bad as some of the other reviewers found it. I just felt that there should have been more to the whole thing. This was enjoyable and I really enjoyed Colfer's writing. The portrayal of the first Doctor was somewhat the same as the television show, but he seemed a lot nicer and more adventurous. There was reference to the 21st century as it is today, which is interesting as that obviously couldn't be done when the show was created in 1963. I'm giving it 3 stars, as it was somewhat fun but I wasn't too excited by the plot. I think if you are gonna do a series in honor of a character, you should make sure the authors get the spirit of the said character right. There's nothing remotely like the First Doctor in this short: the voices of The Doctor and Susan are all wrong plus they would never act in the way they are portrayed here. It doesn't help also that the story is quite boring and unoriginal. There's good books out there with William Hartnell's Doctor like The Time Travelers by Simon Guerrier. Okayish enough as the plot went, if nothing spectacular, but to me the characterisation of the First Doctor seemed completely off, enough so that if I hadn't known this was a One story (because the book said so and because of Susan and the Doctor's physical description), I wouldn't have had any idea which incarnation it was supposed to be, neither from his actions, speech patterns, general behaviour nor thoughts. This adventure focuses on The First Doctor and his grand-daughter, Susan. Unfortunately, the characters of neither particularly resemble those portrayed in the series. The plot itself is adequately interesting but not really engaging. I would rate it at about 2 1/2 out of 5 but will round it up to 3. First in a series of eBooks to commemorate the 50th Anniversary of the show. The Firsg Doctor loses a hand and costed an alien scientist to get a replacement. My main issue with the story was that it didn’t feel like a First Dictor Adventure, hugely disappointing - I won’t be bothering with the rest. I really enjoyed the pacing of this short, and the internal monologues from the First Doctor makes him a really interesting character! A brill start to the anthology and I will be checking out the authors others works, even if the story was a bit (lovingly) daft. به شدت مشتاق خوندن بقیه ی این مجموعه م. منتها بدیش اینه که ... خب این کتابا رو هیچ جا ندیدم. تنها راه پیدا کردنشون اینترنته. متاسفانه. رفرنس هایی که نویسنده داده بود در نوع خودش جالب بود. پ.ن: نویسنده ی این داستان نویسنده ی آرتیمیس فاول بوده. Very charming short story. I am especially fond of the epilogue. Is Hogwarts meant to be hogwash? I have to admit that I've never seen a single episode with the First Doctor. However, that doesn't keep me from reading the novels and I actually liked this one more than I expected. A Big Hand for the Doctor is a short story written by Eoin Colfer and is a part of the year-long celebration for the fiftieth anniversary for Doctor Who (2013). This short story is the first installment of what would eventually be twelve parts – one for each Doctor. A Big Hand for the Doctor focuses on the First Doctor (William Hartnell). 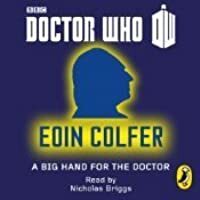 As an aside, I was really looking forward to this short story collection, particularly the first few, because I joined the fandom rather late in the rebooted se A Big Hand for the Doctor is a short story written by Eoin Colfer and is a part of the year-long celebration for the fiftieth anniversary for Doctor Who (2013). This short story is the first installment of what would eventually be twelve parts – one for each Doctor. A Big Hand for the Doctor focuses on the First Doctor (William Hartnell). As an aside, I was really looking forward to this short story collection, particularly the first few, because I joined the fandom rather late in the rebooted series and I knew virtually nothing about the earlier Doctors. So I was hoping that these short stories would give me an idea how these early Doctors worked, their quirks, mannerisms and the like. For the most part, the story was written well, however there were some places where it dragged making the flow of the story uneven and Colfer dedicated some space on world development, which I suppose is to usher in new readers to the series, but seem peculiar for aficionados. The ending while unexpected, seemed forced. A Big Hand for the Doctor takes place before the first episode of Doctor Who ("An Unearthly Child"), which I'm alright with, and introduces a new enemy The Soul Pirates, while a novel idea; I think would have been better served in a novel where more character development can occurred than a short story. Overall, I was greatly disappointed with this installment. I wanted to get to know the First Doctor better, but he was hardly in it and when he was he was totally out of character, which for an anniversary special celebrating Doctor Who is a great disservice. I didn’t like the way the Doctor was portrayed in this story. He spent a long time I’m not very familiar with the first Doctor Who. I’ve watched a couple of episodes with him in them, but they are very different from the current episodes. He isn’t my favourite Doctor, but without him the show may not exist today. The actor who played the Doctor got dementia, so he could no longer act on the show. They had him “regenerate” into a new actor. It was a clever way to keep the story going for 50 years. Uso perfeito da mitologia whoviana. Um conto bem divertido, que soube traduzir para a literatura o clima da narrativa de um episódio da série. O pouco que conheço da personalidade do primeiro Doutor está neste conto, que, pelo fato ser escrito recentemente, faz uso inteligente do caráter atemporal do protagonista. Com certeza lerei os demais, sinto que ganhei uma temporada extra de uma das minhas séries favoritas. The first Doctor needs to replace his hand as it has been cut off by a pirate. He also has to stop the pirates kidnapping children. The story is quite good but I found at times that I couldn't hear the first Doctors voice. I'm not sure how well this story suited this particular Doctor, it felt like his persona had been shoe horned in. An ok read. When they said "short" they meant it... Wow that was short. I was somehow expecting this to be all of them and in reality it was only about an hour's worth of my time. It's a cute story told in true Doctor Who style and I enjoyed it.